The Northern Pacific experienced a climatic shift during the early 1940s, like the North Atlantic . The role of the naval war in the Pacific at the same time is an unexplored issue. Within a very short time the belligerent powers amassed a military, aerial, and naval force on an unprecedented scale. Only science of climatology did not take notice although meanwhile there had been seven decades of time available. Fig. H-1; The North Pacific had only two shifts. The naval war thesis concedes with a shift in weather statistics and temperature decline that started in the early 1940s. 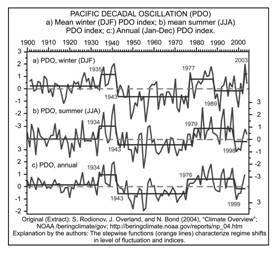 In the Pacific climatic shifts are observed and assessed by the term �Pacific Decadal Oscillation� (PDO), which is an abstract form of North Pacific sea surface temperature anomalies but does not represent them. That is shown in the first graph. A downward shift occurred very suddenly at about 1942 (Fig. above, H-1). Something must have turned the physics and dynamics of the North Pacific toward a cooling mood. 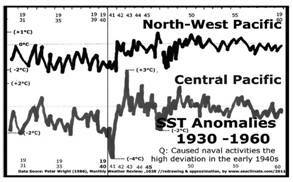 Had it been due to long-term variations in ocean circulation, which produced pronounced patterns of sea surface temperature (SST) anomalies that directly impact weather and climate? (Ross, 2009) This turn also marked the onset of global cooling for the following three decades. Further in the East, in Europe ; it started about two years earlier (Chapter G). 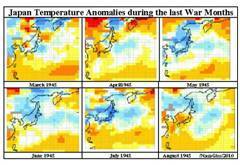 � Japan experienced a very cold winter 1944/45, and a short time later two record cold months May and July 1945. � Before the end of 1945 the entire North Pacific region turned into a cooling mood for about three decades. 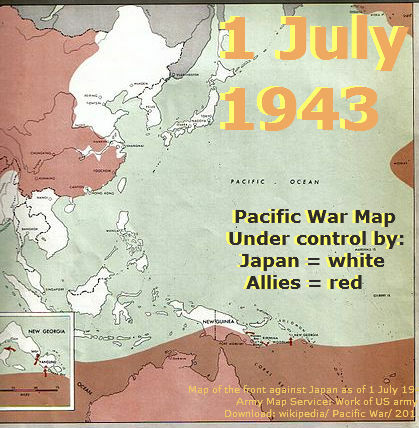 Was the driving impulse been initiated by the Pacific War from December 1941 to August 1945? Any well founded explanation is welcome; as this is the very essence of what meteorological science is all about. This discussion should be regarded as an offer to overcome the unacceptable situation that the global cooling 1940 to 1970 is still not sufficiently explained. __Second: The Central region data deviation in 1941 and 1943 indicate the involvement of the navy, either as data collector, or as an active force that caused changes in the marine environment by operational, training, or warfare activities. This is of little help and requires other parameters to prove the matter. 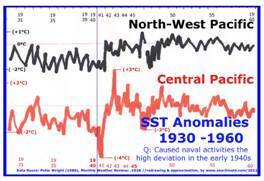 It is therefore necessary to widely rely on observed air temperature data series to demonstrate that a link between naval war and the climatic shift is a promising issue. Even if the naval war contributed with a small extent, it would be time to understand the mechanisms involved, and to include them in the climate change debate. 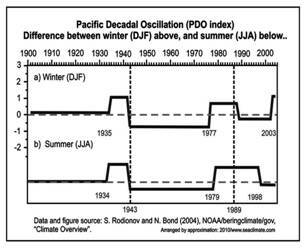 Taking a first view at the Pacific Decadal Oscillation Index (PDO), Figure H-1, indicates that a driving mood started soon after 1940, which would fit perfectly into the period of the commencement of naval war in the Pacific after the Japanese ambush at Pearl Harbour on December 7th 1941. From this day on the United States started to organise a naval and airborne force to operate in the Western Pacific with breathtaking dimensions, a huge air bomber force, naval surface vessels, and submarines which alone sank about 1,400 merchant and naval vessels representing a total tonnage of 5.0 million tons. All numbers given are only rough estimates. The number of submarines increased from a few dozen in 1942 to well above 200 in 1944, during which more than 40 boats where on war patrol simultaneously. The US Navy lost 48 submarines in the war zone of the Pacific. Together with the increasing US surface fleet and the bomber capacity since 1942 total losses for Japan amounted to 10.0 million tons, or about 3,000 vessels including about 110 submarines. Allied material losses were considerably less, but accounted as well to approximately 1,000 ships, and many thousands of aircraft. Alone due to naval activities, one can assume that many millions of shells have been fired, many ten thousand bombs dropped into the sea, many thousand sea mines laid, depth charges released, and torpedoes fired. The number of Japanese sea mines in the Japan Sea seems to have been so effective that US submarines avoided this as area of operation. 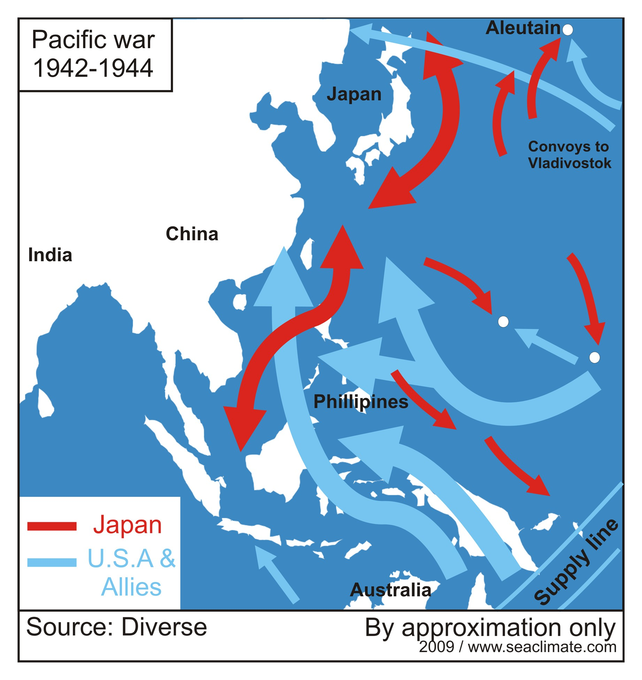 The US and Allied forces advanced from South and South-East via Singapore , Indonesia and the Philippines before reaching Okinawa in summer 1945, but had been also active further north, e.g. at Midway (06/1942) and the Aleutian Islands (June 1942 to August 1943). 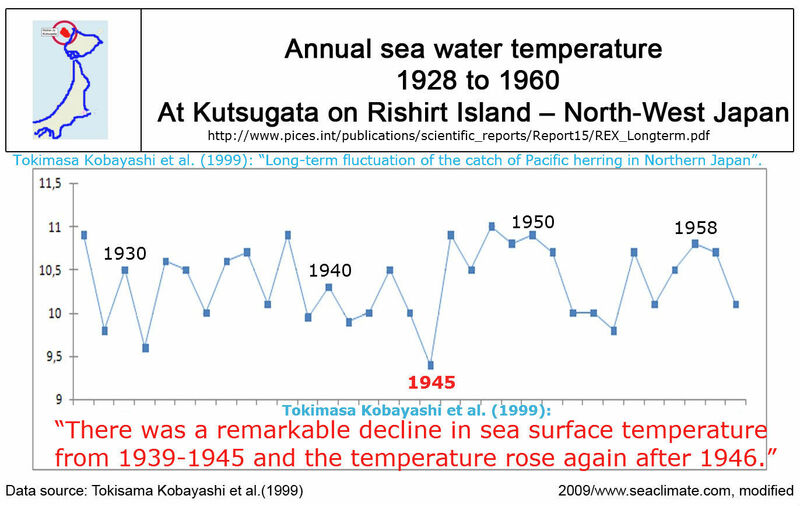 The war in the Western Pacific was a physical factor in the marine environment never experienced before, and an immediate correlation to the downward trend of air temperatures is obvious. 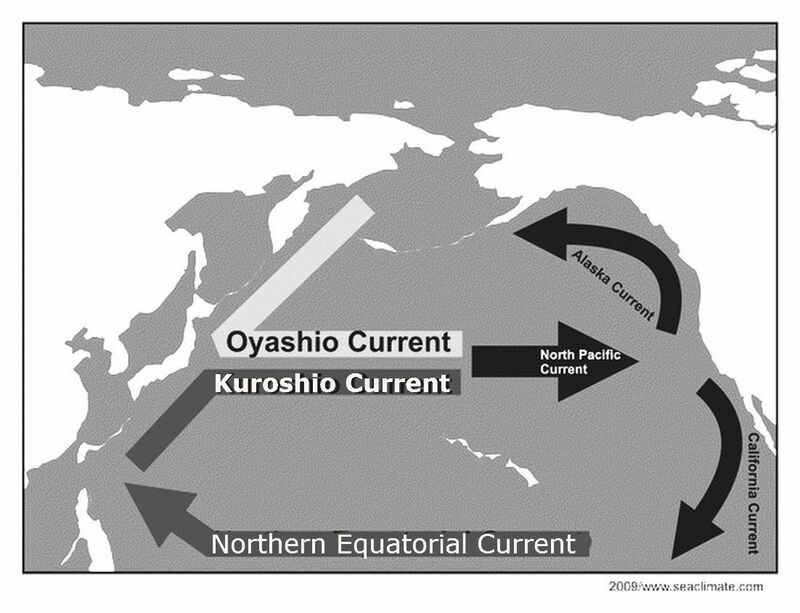 Actually the US force moved with the warm Kuroshio Current towards Japan (Fig.H-3). The warm water layer is thin. 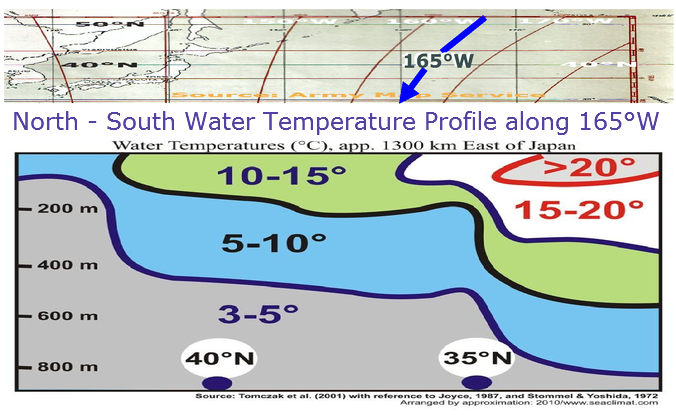 The average water temperatures of the whole North Pacific basin are about 4�C, with a wide range of salinity. As naval activities could have changed the structure over a considerable depth manifold, it seems of little help, and for this paper impossible, to raise and discuss such matters of physical-dynamics. Vice versa, certain observation will be presented, which require an explanation, and which should be further investigated in context with the climatic shift in the Pacific during WWII. c. A cold winter in Japan 1944/45 only due to natural variation? Only nine months before Japan surrendered in August 1945 the country went through an unusually very cold winter 1944/45. 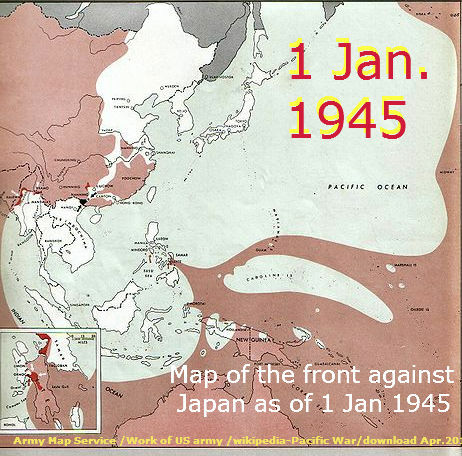 Since autumn 1944 the US Navy recaptured the Philippines , this actually lasted until the surrender of Japan one year later. One of the largest engagement took place in the Leyte Gulf, and covered a number of clashes and fighting that are know as Battle of the Leyte Gulf. The belligerents employed at least 40 carriers, 20 battle ships, and about 200 cruisers and destroyers, as well as many hundreds of airplanes. The distance to Okinawa was not more than about 1,000 km and to the south of Japan 2,000 km. 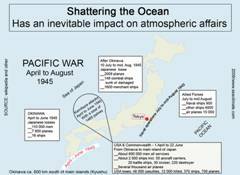 Japan �s North-South supply lines could be penetrated more effectively by submarines and bombers. 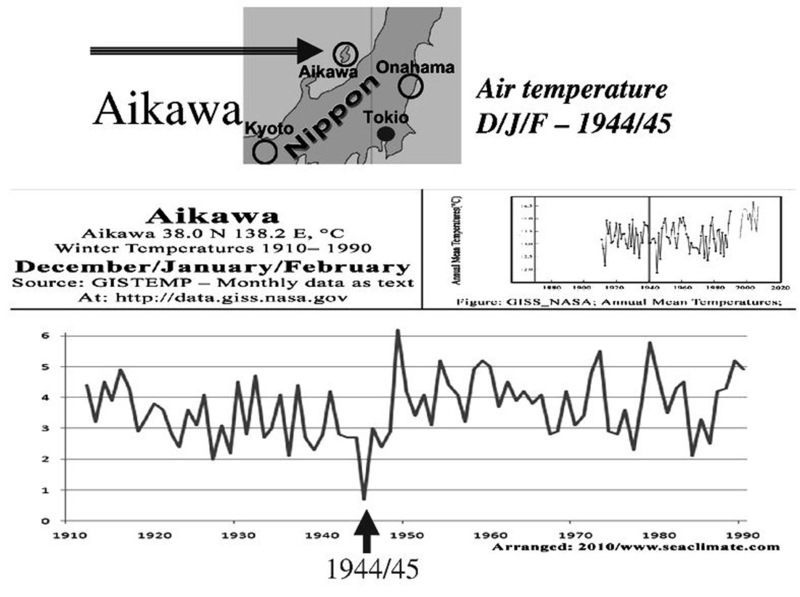 Water masses from the military operations or attack areas were carried with the Northern Equatorial Current and Kuroshio Current towards Japan within a short period of time, and suddenly Japan had an exceptionally cold winter based on the months of December 1944,January and February 1945. The exceptionality of the winter is documented by air temperature data as provided by NASA/Giss, Fig.H-5, which cover a maximum period from 1880 to 2009, but sometimes less. First it is to show what happened, where it happened, and which forcing mechanism should be considered. To begin with the significance of what happened shall start with the well known city Kyoto , a city in a mountainous region. This interior positioning results in hot summers and cold winters, although the Japan Sea in the West and the Pacific Ocean in the East are within a few dozen kilometres. 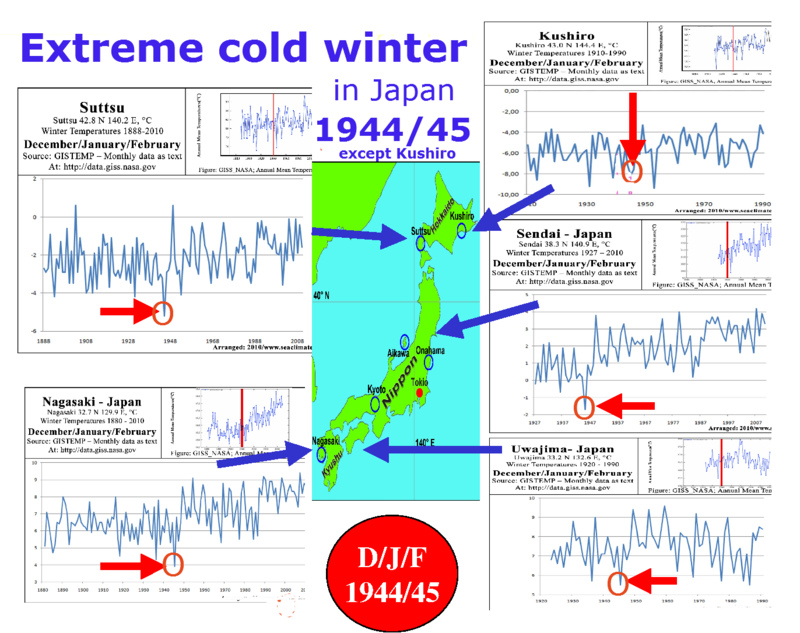 The interior condition prevented Kyoto from experiencing an all time cold record in winter 1944/45. 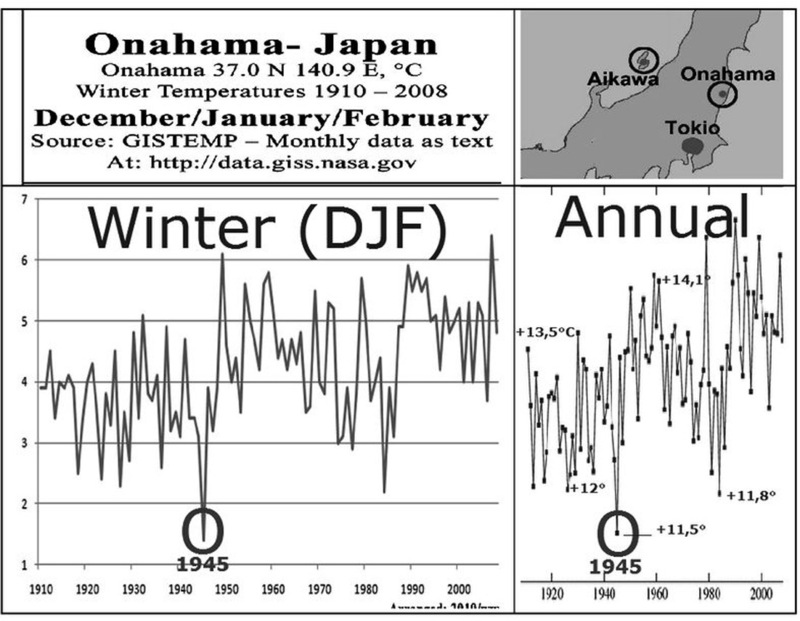 The D/J/F temperature had been merely the coldest since 53 years, while 1892, 1884, and 1882 were significantly colder. That has been differently at other stations in Japan . In contrast to an inland station, there are for example two coastal stations, one in the Sea of Japan , Aikawa (Fig. H-6), the other on the Pacific Ocean , Onahama (Fig. H-7), located at almost the same latitude (ca. 300 km apart), and at a distance to Tokyo of about 250/200 km and in NW/NE direction. 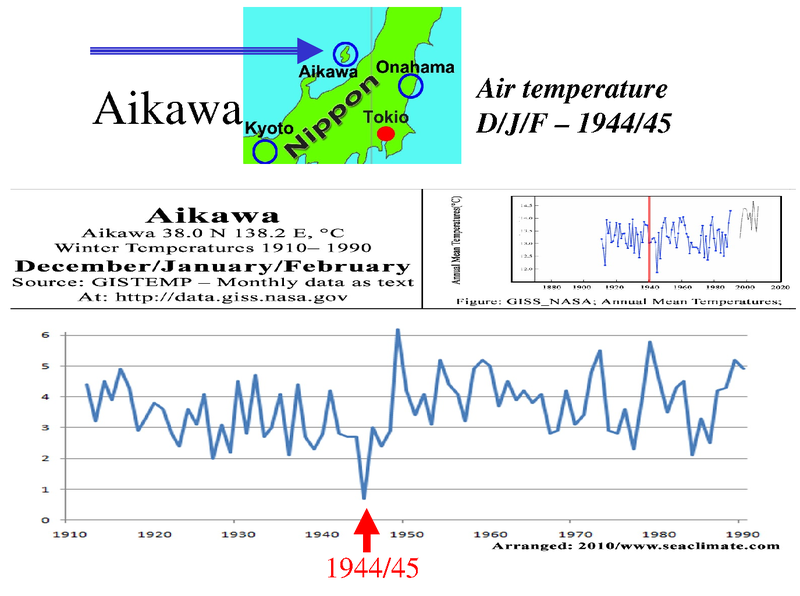 The excessive low winter temperature 1944/45 at both stations is remarkable and presumably can not be explained with natural �variability�, but must have been strongly influenced by the low temperature conditions of the sea water, caused by naval war activities. That is confirmed by individual locations (Fig. H-5). 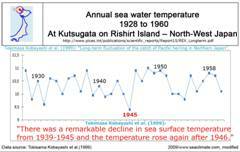 While the temperature deviation in Suttsu during winter 1944/45 is extreme over the shown period from 1888 to 2009, the station at the shore of the Pacific, Kushiro , did not experience an unusual drop in temperatures. Any consideration of this divergence has to include the very different sea current conditions. 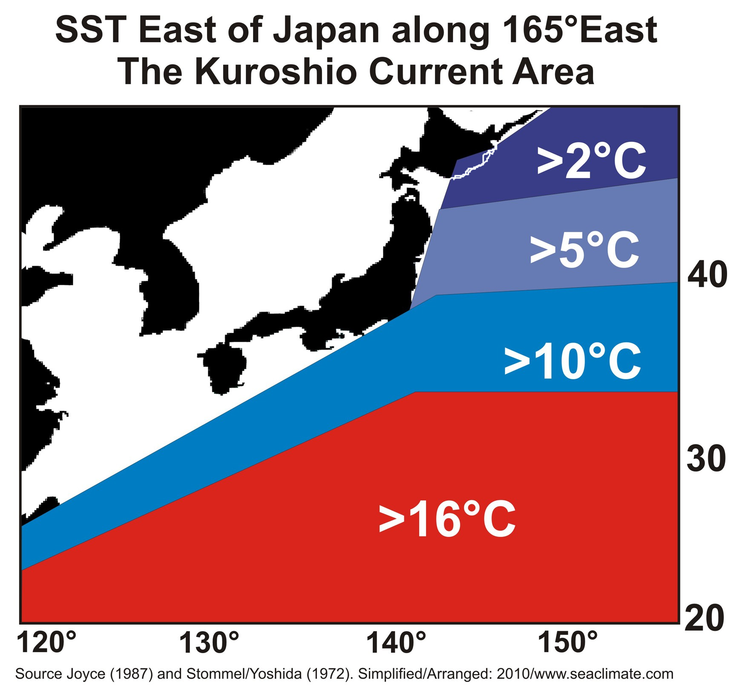 Three of the four coastal stations mentioned are highly influenced by warm water currents from the south, whereas the Kushiro station is within reach of the cold Oyashio Current (Fig. H-3. While the Oyashio Current was presumably the least affected by naval war activities, the warm currents coming from the South have been affected. Warm water current can quickly be cooled down by pushing cold water into higher sea water levels, as deeper water layers usually have 10-15�C lower temperatures. 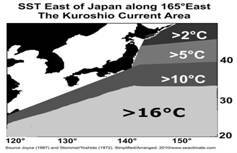 � Those coastal stations at Japans west or east coast that are influenced by warm water currents from the south showed record cold winter temperatures. � Only at the most north-eastern station Kushiro , influenced by the Okhotsk Current transporting cold water from the north, the winter situation remained close to average. � The inland station at Kyoto clearly shows the significance of the last war winter, but much less striking as Nagasaki in the south and Suttsu in the north. 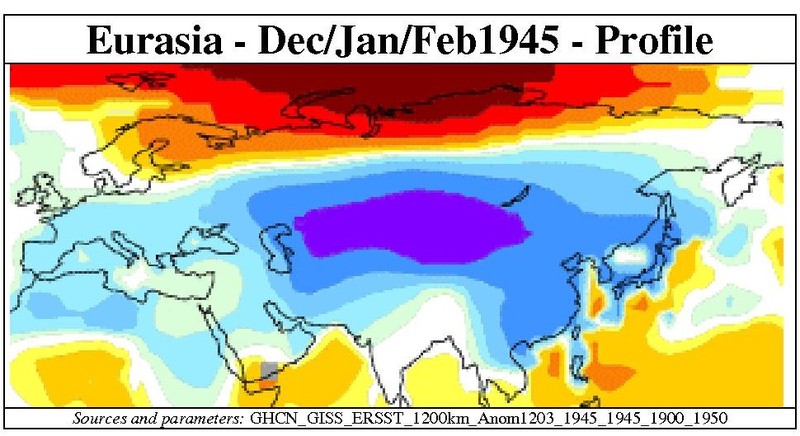 Based on NASA/ GISS Surface Temperature Analysis for the winter 1944/45 (DJF), TM13 (pervious page) shows a region from the North Atlantic all over Eurasia up the East coast of Japan, with a core cold area east of the Caspian Sea up to China. Whether this remarkable result is in part the product of extreme military activities all over the North Atlantic, or in Western Europe over the year 1944 and during the winter months 1944/45 is not to be debated here. I will also refrain form making any comments with regard to war activities in China , but comment on the possible impact of naval activities in the western Pacific. 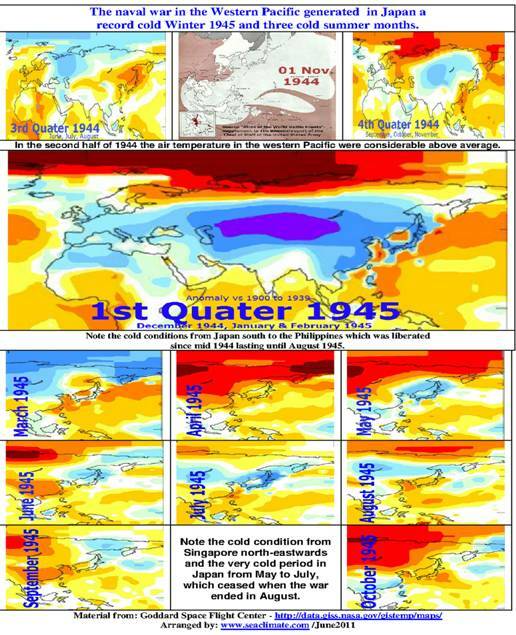 It seems worth noting that there were cold stretches along the entire coast of China , including Taiwan and the Philippines , as well as a considerable sea area in the south of Nagasaki . If this data can be trusted, it seems only logical to link them, at least partly, to the enormous naval activities which took place during that period of time. Such an approach is even more inevitable with regard to all coastal seas around Japan , which are fully included in an area of cold air temperatures, together with the western Sea of Japan up to Vladivostok . Remarkable is the well noticeable contrast along the eastern coast of Japan, between low temperatures very close to the coast line, and the much higher sea temperatures further off the coast. The winter 1944/45 is evidently unusually cold. Since January 1945 a huge military machinery closed down on Japan rolling northwards from Burma, and the Philippines, or closing in from the East after the strategic Iwo Jima Island had been conquered in a battle lasting from February 19 until March 16 for which the US Marine Corp employed 450 ships, including 6 battleships, 4 cruisers and 16 destroyers, and manpower of 50,000 soldiers. To prepare for landing the island was bombed for 72 days by B-24s from the Marianas , while naval ships bombarded the island for three days. Since summer 1945 the USA was able to commence 1,000 bomber raids from Iwo Jima against Japan . There were many other naval activities underway, from bombing, kamikaze flights, mining, submarine encounters, and shelling, of which the last major battle concerning the occupation of Okinawa, began on April 1, 1945 and ended June 21, 1945. The amount of war material employed and lost was gigantic. After the Battle of Okinawa had ended the Japanese lost further 2,000 planes, 140 combat ships and 1,600 merchant vessels until surrendering on August 14th 1945 , while Allied forces could operate with the strength of 900 naval ships, 4,000 auxiliary ships, and 15,000 airplanes. That is certainly only a small part of the story about what has happened in the western Pacific during eight months at war in 1945, and it should come as a surprise if that should not have left any traces in the marine environment, and on the climate. 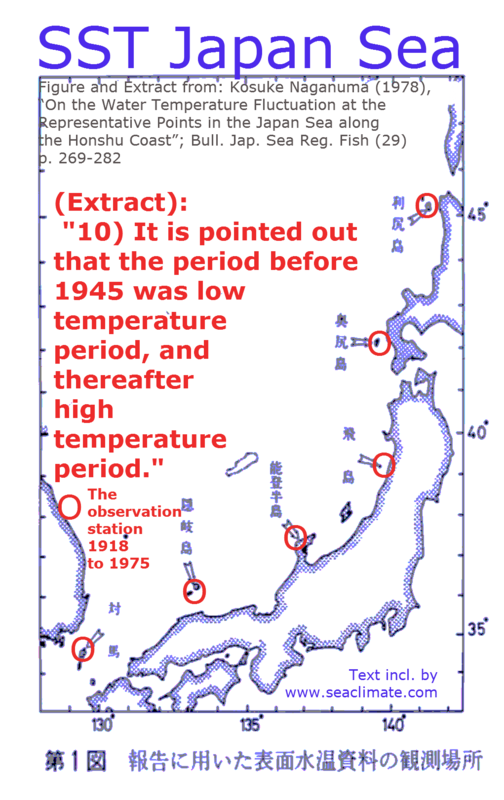 This issue is addressed as an example in the hope that it may one day be taken up to assess the matter in greater detail, because a brief review of a number of Gisstemp stations in Japan showed very cold temperatures just at the time when the Allied forces approached the shores of Japan in summer 1945. The TM13 (p. 181) illustrates the temperature situation for all war months in 1945. The months May, June and July show sub-normal temperatures. 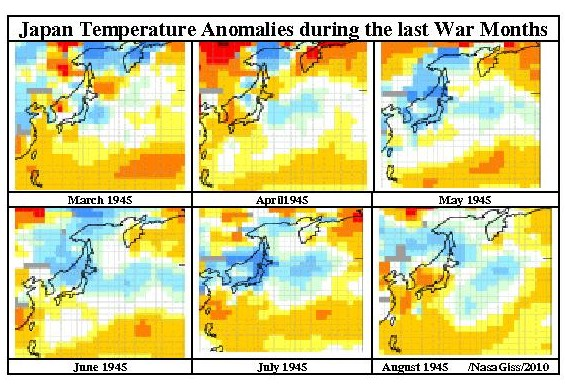 By a bit leniency one can argue that the negative anomalies are close to the Sea of Japan, the east coast of Japan and adjacent ocean areas eastwards, with the exception of August 1945. Was the sudden increase of temperature due to the fact that the war had ended on August 14, 1945 ? 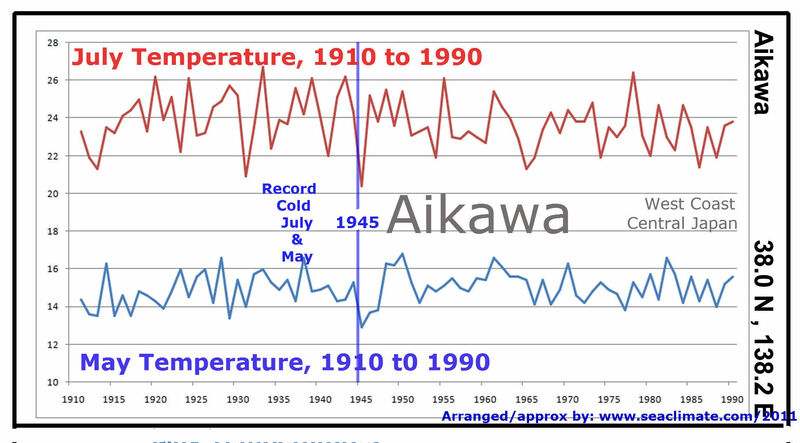 The analysis becomes more concrete looking at the individual monthly temperature data, as at all stations from Southern Japan to Vladivostok where May and July data are particularly cold, and for a number of stations on the main island of Japan the coldest on record. f. A clue from SST and correlation? It is not much that can be offered on available sea surface temperatures. On one hand too few have been taken in those days, and for me and this research they have not been accessible, respectively barred by language barriers. It is hoped that this consideration may stir the interest to collect and publish such material in an accessible manner. 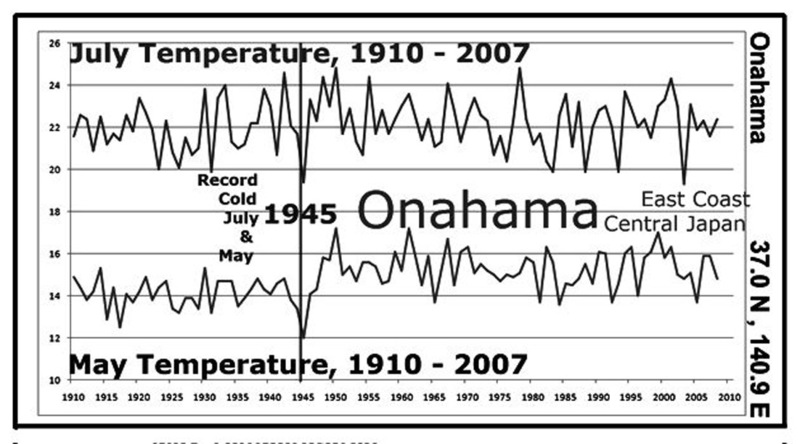 Naganuma (1978) confirms a shift in 1945 by noting in his English abstract (item 10): �It is pointed out that the period before 1945 was a low temperature period, and thereafter a high temperature period.�. 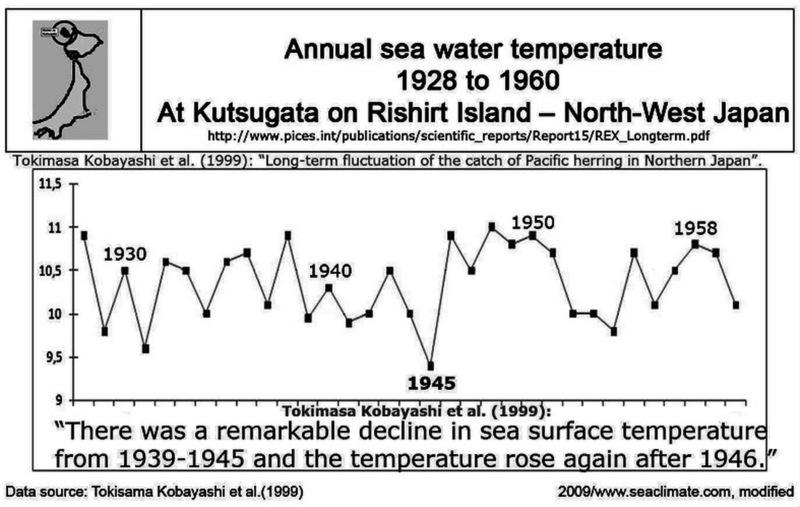 The annual SST at Rishirtin 1945 is well indicated in Figure H-11. 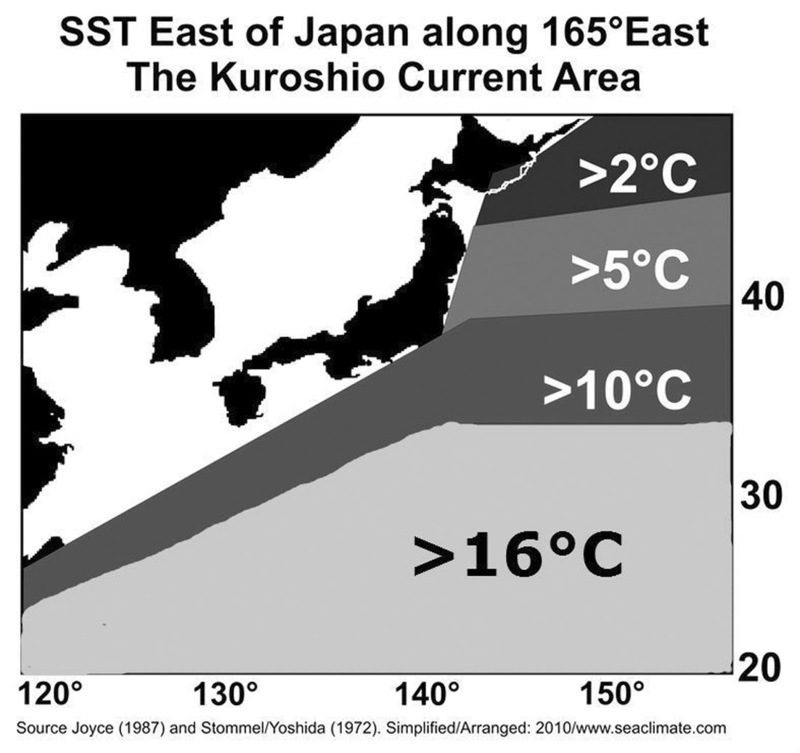 Interesting is also the graphic by Kobayashi (1999) on the April SST in a bight south of Tokyo (Fig. 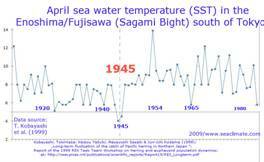 H-12) The SST during the months of April 1944 and 1945 are at unusually low levels. Kobayashi et al. also observed that the SST had been generally low between 1939 and 1945. This investigation demonstrates that it touches a matter of high scientific relevance, and is a unique opportunity to better understand the function of climate and the relevance of human activities. On one side it could be shown that it seems highly unlikely that there has been no mechanism between naval activities in the western Pacific and the observed record low temperatures, but I am only in position to guess on how it might have worked, and even less certain about the question, whether it had caused any initial or long term cooling in the North Pacific from the mid 1940s to the mid-1970s. But what would be the consequence if one assumes that the low temperatures in Japan had been caused by regional naval activities in the Western Pacific? Did any impact just have a short term effect on the most upper sea surface layer, or did the activities penetrate much deeper over several dozen meters, with substantial changes of the sea structure concerning temperatures and salinity? When processes had been initiated in this way, and how long would it take for the sea to return back to a pervious stage? None of these questions can be answered here. 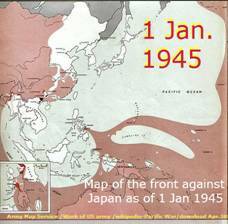 The exceptionality of the winter 1944/45, and other months in 1945, indicate that the penetration was severe, so severe that in perfect simultaneity the Northern Pacific turned from a warm phase to a cold phase. g. The Shift in the Pacific � mid 1940s �? The scope of assessment: In the mid 20th Century there had been a 35-year lasting period of global cooling, which had started between 1940 and 1945. The reasoning for causation goven by climate science is rather limited, and hardly sufficient. Cooling was evident in the Pacific as well. Could naval war in the Pacific over just three years have contributed to trigger a climatic shift in the North Pacific? If it was not naval war, which mechanism caused the large discontinuity in the mid-twentieth century in observed global-mean surface temperatures? Was it a �natural event�, or by what kick off was this process set in motion? For none of these questions there are satisfying answers. There is the global issue, which turned sea and air temperatures toward cooling in the early 1940s, particularly all over the Northern Hemisphere. If naval war did play any role in this respect, however in the North Atlantic and its adjacent seas the naval war in Northern Europe definitely contributed highly. This is due to a much higher extension of the northern North Atlantic towards the pole, and the sensible structure of the warm Gulf Current system that flows through colder water up to the Arctic Ocean . One has to assume that any substantial climatic shift generated in the North Atlantic will inevitably show its impact on the North Pacific as well. This makes the identification of any contribution by the Pacific Ocean to an observed climate shift not easier, but is worth a try, because it would not mean that the Pacific did not contribute significantly. Criteria to evaluate the climatology of the North Pacific are numerous, with regard to the basin itself, in relation to immediately connected or more distant systems. There is for example the question whether variations in the tropical Pacific and North Pacific are interrelated? Some say no (Latif, 2001), others assume a remote link (Newman et al, 2003). Therefore this investigation will not try to answer that, but to assume that some sort of interaction exists, while leaving wide open any notion about the degree and time scale. Here the question is whether human activities can be blamed on causing a climatic shift in the 1940s, because it is all about physics and dynamics in the ocean sphere and naval forces operating in the marine environment during the Second World War generating an immense forcing potential. The forcing mechanism could have been an external force, or internal forces, but in the end it must have been a force that can be named and quantified in physical or physic-dynamical terms. Efforts have been made, but not convincingly. 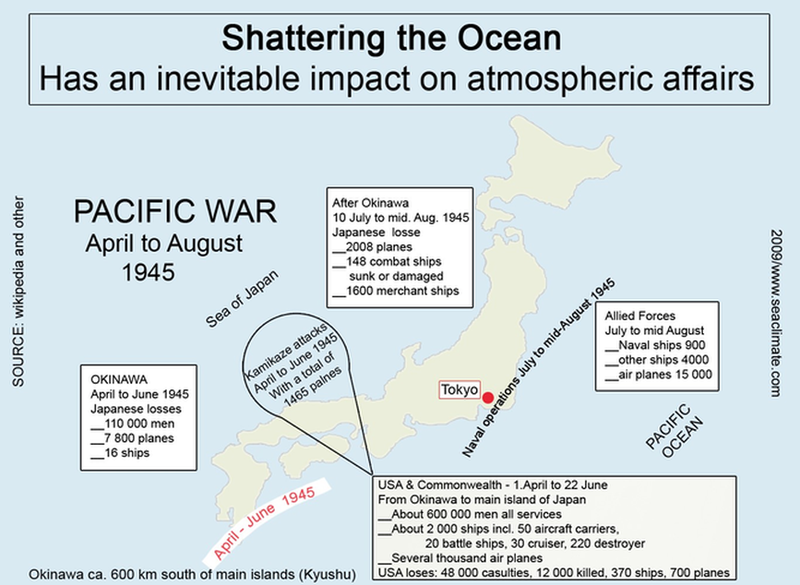 While naval activities, just like any wind, have an impact on the upper sea surface layer concerning the temperature and salinity structure, the vastness of the North Pacific in extension and volume, makes it hard to assume any relevance between WWII and the observed climate shift in the early 1940s. But as long as the reason for the shift has not been evidently established, naval war activities need to be regarded as an option, and should not been ignored. The question is about the impact human activities may have on climate, and this should be known completely as soon as possible. 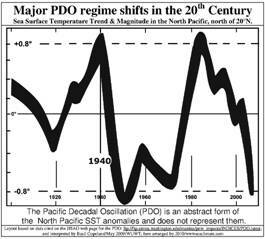 For this reason this investigation restricts the scope on the so-called Pacific Decadal Oscillation (PDO). The PDO issue shows a change of sea surface temperatures (SST), by representing a pattern of SST anomalies in the North Pacific. The matter is about warm or cool surface waters in the Northern Pacific, actually north of 20�N, respectively north of Hong Kong, Taiwan, and Hawaii, which does not fully match with war activities in the West Pacific that includes the Philippines, the South China Sea, and other regions south of latitude 5� North. 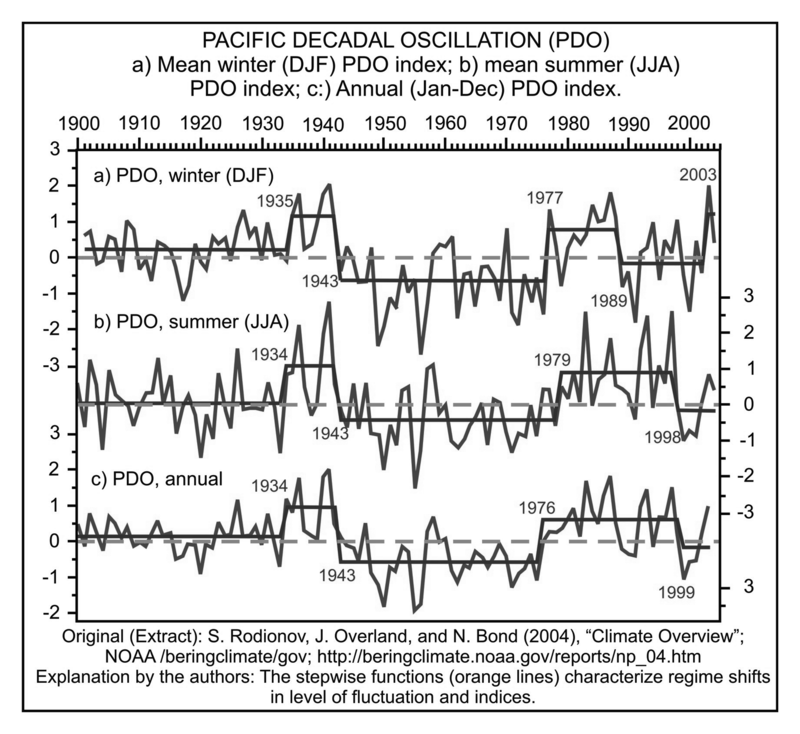 During a "warm", or "positive", PDO phase, the west Pacific becomes cool and part of the eastern ocean warms up; while during a "cool" or "negative" phase, the opposite pattern occurs. 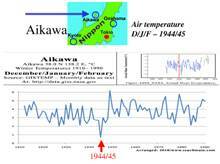 With regard to the WWII situation, until 1939 the water off Japan �s shores was colder, which was reversed by the end of the war, when the sea surface temperature in the Asian part became warmer, while on the American side the water cooled significantly. Until now no mechanism has been identified to explain the shifts. They are rare, and occurred only six times over the last 300 years: 1750, 1905, 1946, 1977, 1998, and 2008 (Biondi, 2001). Concerning the last century N. Mantua identifies two full PDO cycles: with cool PDO regimes from 1890-1924 and again from 1947-1976, while warm PDO regimes dominated from 1925-1946 and from 1977 through (at least) the mid-1990's (Mantua, 2000), whereby timing may vary according to the researcher, e.g. 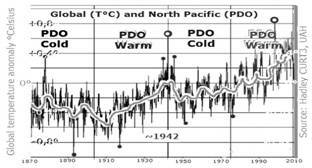 saying that a warm phase lasted from 1925�42 that turned into a cold PDO cycle from 1943�76 (Zhang, 1996). 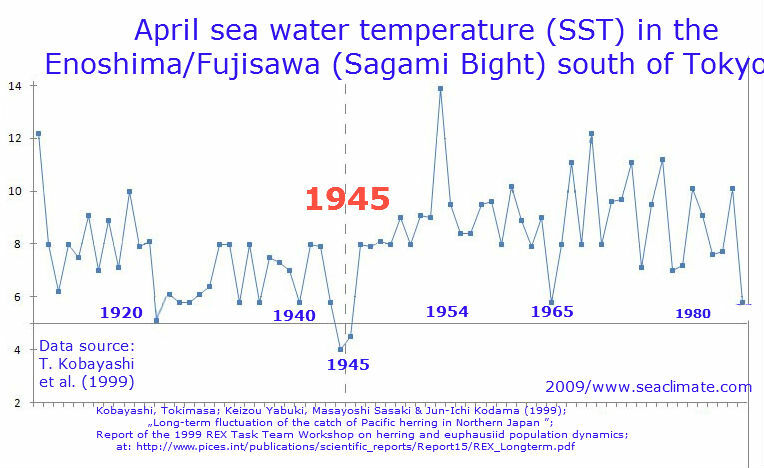 Although the sea surface temperature (SST) data taken during WWII should only be used with caution (Bernaerts, 1996), they need nevertheless be assessed with regard to timing. But the shift in SST and SAT (surface air temperature), show a different time, first in the Europe/Atlantic area (between 1940 and 1942), and in the North Pacific between 1942 and 1945. 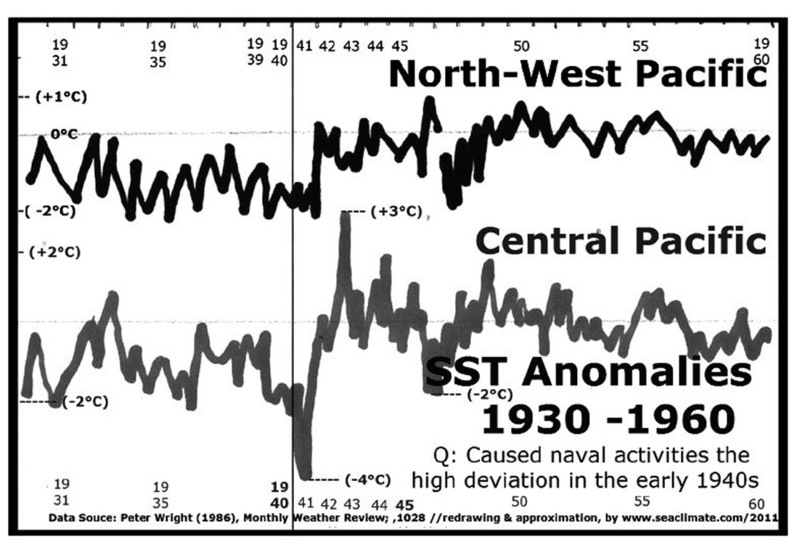 The set of given SST graphics indicate, at best that pre WWII warming continued maximally until about 1942. Fig. 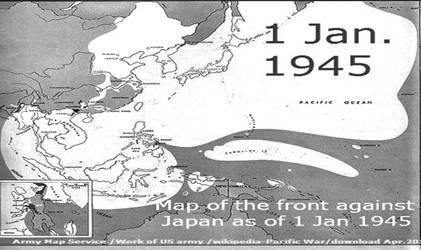 H-14; The shift in 1943 happened without delay. � __the first positive phase appeared in summer 1934 and briefly later in winter 1935. 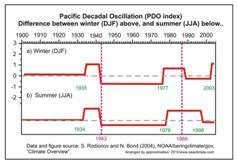 � __the second positive phase even indicates a longer delay (1977 to 1979) and a reversed timing, in winter earlier than in summer. 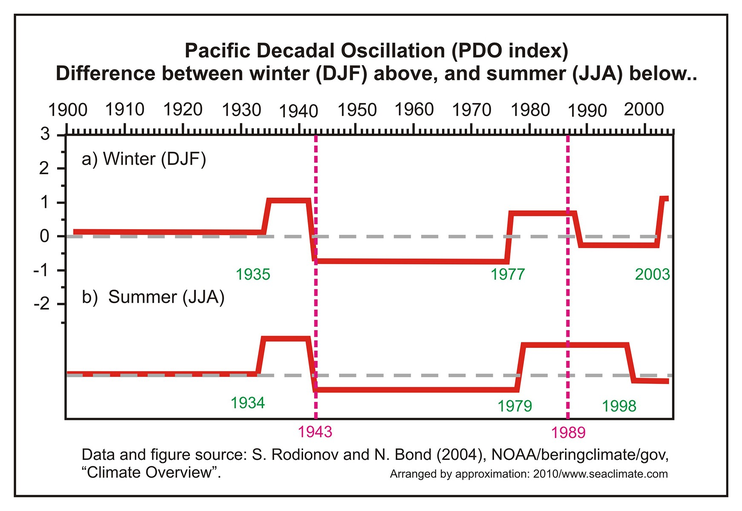 The most important information one can get from the graphic is the timing of decline in the year 1943, which not only shows that the level of decline is lower than during the other two available time periods, before 1934/35, and after 1989/98, but it is the only trend change that occurred in winter and summer alike and without any delay. While both aspects could be of importance to determine any naval war impact, the simultaneous trend change is a clear indication that something �extraordinary� must have happened, something that was not just a gradual change from one mode into another. A simultaneous change requires an �unusual� force, such as a volcanic eruption, sun-spot activities, or a tsunami, to show the same simultaneous effect in timing without any delay. If there was no �special situation� causing an immediate reaction, the marine environment is too dull to show its agreement in subsequent seasons. In so far as one has to assume that usually there is some delay in time, if not, one has to look for an explanation, why the change in 1943 was different from the other shifts observed. 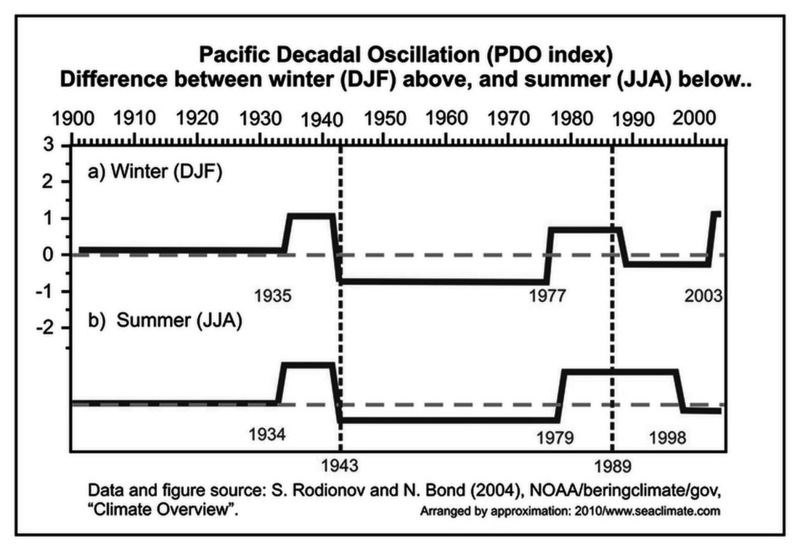 The role of the Pacific Ocean in the only global cooling period since the last Little Ice Age from the early 1940s to the 1970s is little understood, although the occurrence of the decrease of global air temperatures appeared simultaneously with the spreading and intensification of naval war from Europe into the Atlantic, and in the Western Pacific until Japan was defeated in August 1945 This should not make it more difficult but easier to figure out and understand the reason. The prevention of anthropogenic induced climatic changes is very much in demand, and even the smallest contribution by naval war activates during WWII should not be ignored. 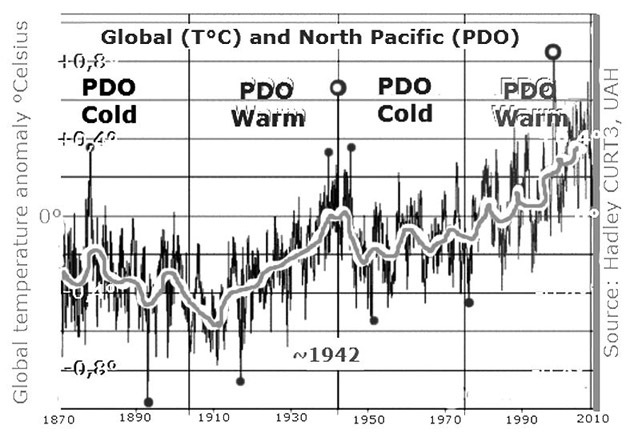 By showing that naval war activities presumably had very substantial effects on temperature conditions in the Western Pacific over several months, it is no longer possible to deny outright that this did not have any impact on the wider Northern Pacific Ocean and the trend as indicated in the Pacific Decadal Oscillation. 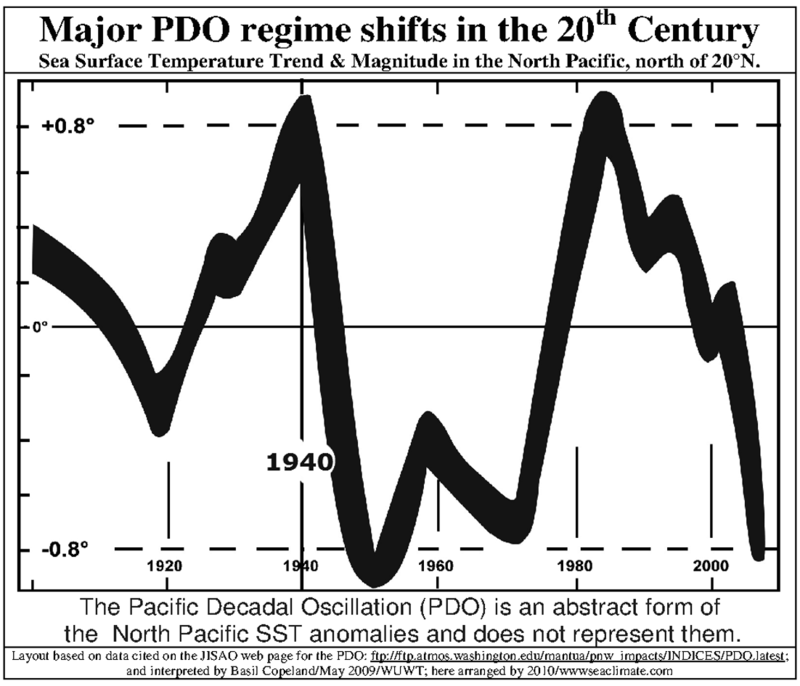 The decline of the PDO at about 1943 has unlikely been caused by the naval war in the Pacific, Atlantic, or Europe alone, but it can neither be excluded that it contributed significantly. Ignoring these facts and connections is in this respect unacceptable.. Figure H-17; Bombing at sea. Figure H-18, Battle ships en route. Figure H-19; White areas still under control or occupied by Japan . 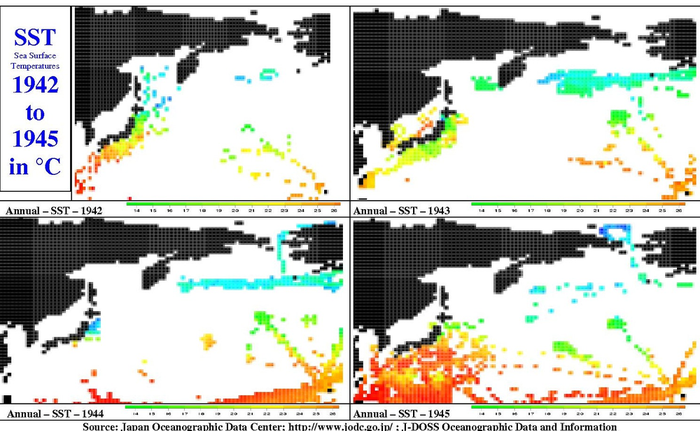 Bernaerts, Arnd (1997), �Reliability of Sea-Surface Temperature Data taken during War Time in the Pacific�, PACON Proceedings, October 1997, pp. 240-250. The Marianas are the northernmost islands of a larger island group called Micronesia, situated between 13� and 21� North, and from 144� to 146� East. The distance to Tokyo is about 2,400 km. They had been recaptured by August 1944 and after rebuilding an air strip in Tinian over the next several months, a total of 19,000 combat missions were launched alone from here against Japan . By August 1945, Tinian was by extent and operation the largest airbase in the world, and accommodated nearly 1,000 B-29s, the so-called: Superfortress with an armament of: 12 .50-caliber machine guns, 1 20 mm cannon, 20,000-pound bomb load, and for example, in March 1945 B-29s laid mines in Japan's Shimonoseki Strait to interrupt shipping. USA losses: 48,000 casualties, 12,000 killed, 400 ships (10% sunk, 90% damaged); 700 planes. Japanese losses (approximate) __110,000 men; __7,800 planes; _16 ships; Kamikaze attacks on ships: By about 1,465 planes. Kosuke Naganuma (1978), �On the Water Temperature Fluctuation at the Representative Points in the Japan Sea along the Honshu Coast �; Bull. Jap. Sea Reg. Fish (29), p. 269-282. 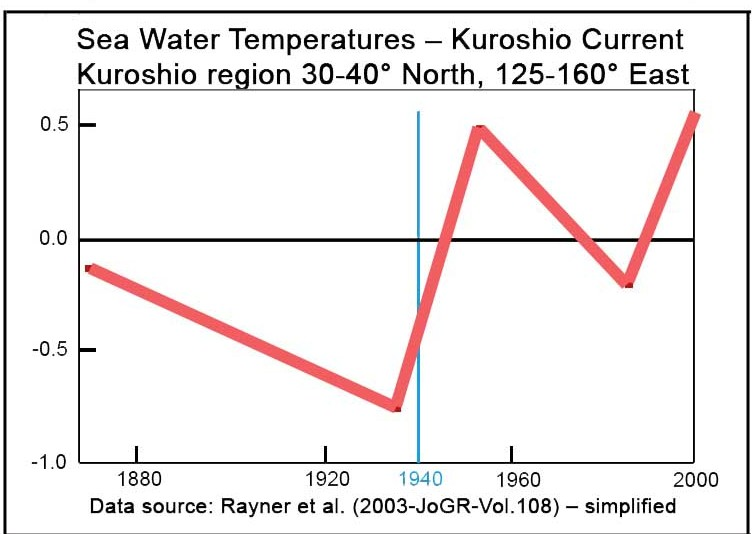 ___(Extract): The surface water temperature analyses were carried out on those data observed during the period from 1918 through 1975 at several points along the Honshu coast of the Japan Sea , Tsushima, Oki Islands , Noto Peninsula , Tobishima, Okujiri-t�, and Rishiri-t�. ___(Extract): 3) The annual average temperature at each point varies as low as 0,8�C for every latitudinal degree from the south to the north.